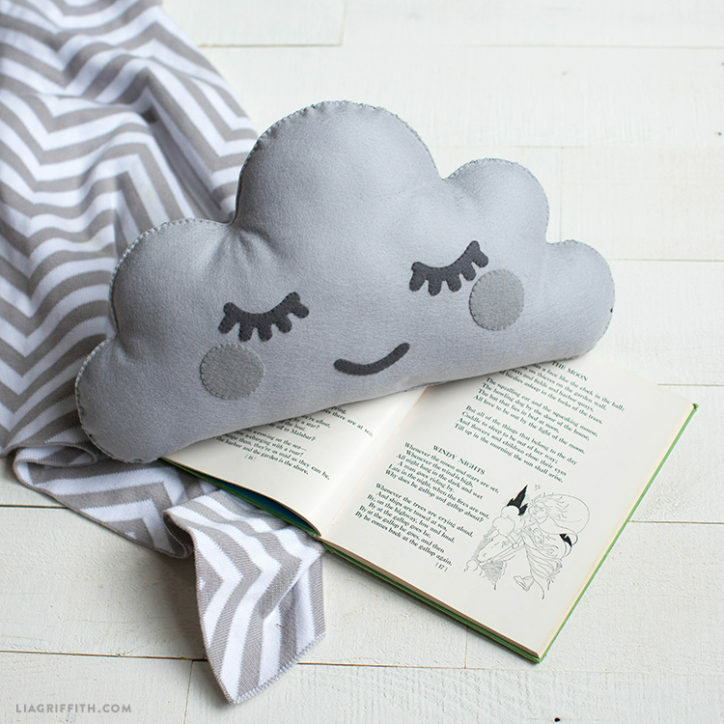 Make Your Own Hand Sewn Felt Cloud DIY Pillow! Dream With Your Head in the Clouds! Some say it’s a nap, we say it’s a horizontal life pause. 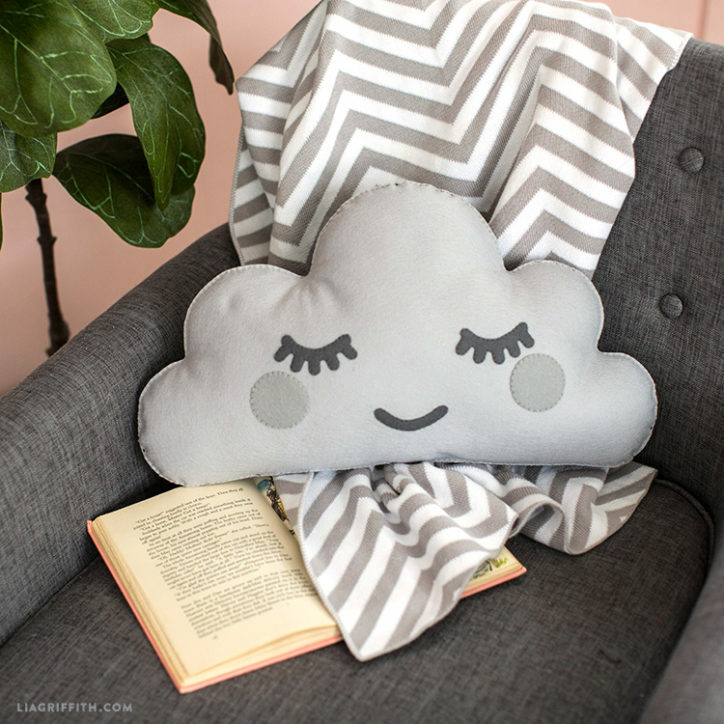 Either way, siesta in style with this adorable felt cloud DIY pillow! You can create your own dreamy pillow with our easy-to-follow tutorial. We have provided the PDF pattern to get you started. Simply gather your tools, materials, and creativity, then join us on a creative trip to sleepy-town! 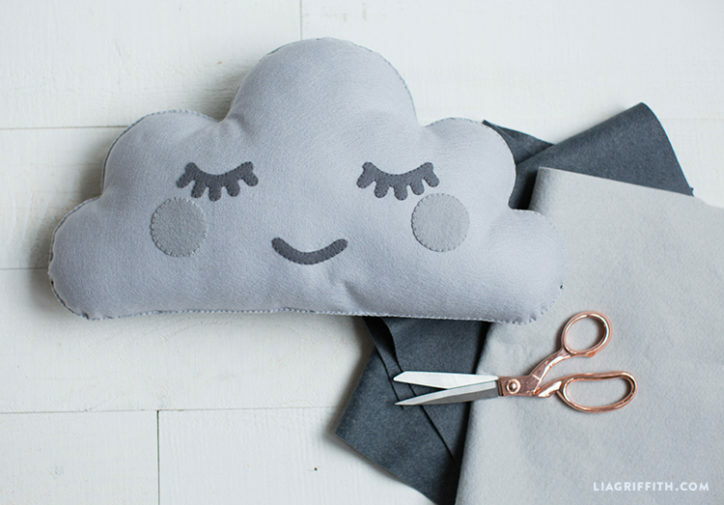 Your felt cloud DIY pillow would go really well with our sleep mask iron-on, which you can create here. Print, cut out, and tape together the paper pattern for the cloud shape. Trace the pattern on the wrong side of the felt using a pencil or fabric marker. Cut out 2 pieces of felt for the front and back of the cloud. We cut a dark grey for the back, and a lighter grey for the front. Cut out felt pieces for the face according to pattern, cutting with small detail scissors. Position the eyes and mouth on the front of the cloud. Whip stitch into place using 1 strand of matching embroidery floss. Whip stitch on the blush just under the eyes using 1 strand of matching embroidery floss. Pin together the front and back of the cloud. Starting from the bottom, blanket stitch the two pieces together using 3 strands of matching embroidery floss. Finish blanket stitching closed. Poke the needle and end of thread into the seam of the pillow and out the back, snipping the end close to the felt. We are here to help you explore your creativity with daily inspiration, downloadable cut files and printable templates that make your craft life easier. We believe in the power of creativity to nurture the soul and to empower us. Our designs are created with simplicity in mind and we always strive to provide you with the highest quality DIYs. Share what you’ve been up to by using #MadeWithLia — your creativity is our biggest inspiration!